Come join the Collinsville Title I Department and Fairmont City Youth Program for some spring fun! Free books, ice cream and prizes! 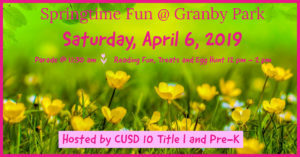 Learn more about Collinsville Community Unit School District #10 Title I Reading Program and Pre-Kindergarten.